This week we are coming together as a restaurant community to raise funds for North Bay fire relief through a city wide event — ChefsGiving. Both Perbacco and barbacco are participating to raise funds to be donated directly to the Tipping Point Emergency Relief Fund and Restaurants Care. To learn more about these non-profits, click here. 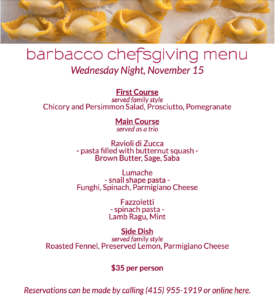 This Wednesday, November 15 at barbacco we will host a fundraising dinner with the same format as our monthly Pasta! Pasta! Pasta! 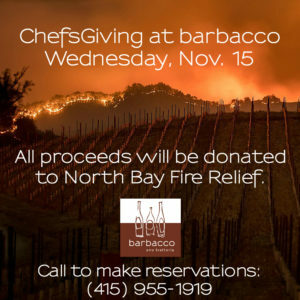 dinners where all proceeds will be donated to the ChefsGiving charities in support of North Bay fire relief. In addition to our complete barbacco dinner menu, we will offer a special $35 pasta dinner that includes an antipasto, three of our favorite pastas, and a side of seasonal vegetables. Reservations can be made online here or by calling barbacco: (415) 955-1919.